Scents of fried apples, sage, and brown butter lead, supported by hints of herbs de Provence. On the palate, salted caramel and lemon curd. The finish is a lingering silkiness of apple butter, acidity, and summer savory. Pair this cider with a sharp bleu cheese, a warm ginger cookie, or crustless Italian cheesecake. 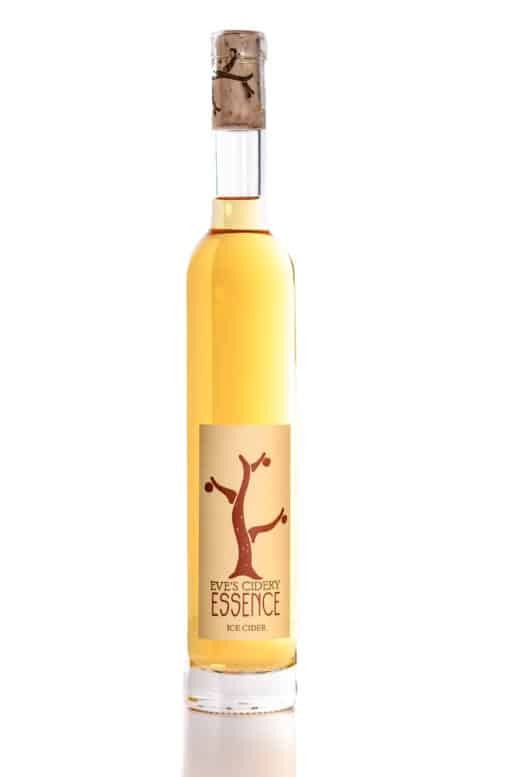 In October of 2018, we released the 2017 vintage of our Essence ice cider after nearly a year from pressing to bottling. We pressed our apples—a blend of Spigold, Melrose, Fuji, Idared, Jonagold, and Empire—November 9th through November 12th, froze the juice, and extracted the sweet essence in early February of 2018. From 2000 gallons, we pulled 330 gallons of high brix juice to ferment and bottle. The 2017 vintage is unique in the successfulness of the extraction and in the duration of fermentation. The cryoconcentrated juice measured approximately47 brix in February, so high that we had difficulty getting it to ferment. After three inoculations with yeast and 7 months fermenting in stainless, the cider contained 260 grams of sugar/liter and 9.45% alcohol. To reduce the residual sugar and add some tannins, we blended in dry bittersweet cider, resulting in 20% residual sugar and 9.2% alcohol.